WiFi Logger ThermaData TD2TC - two channel WiFi logger with 2 type K or type T probe sockets. Please choose your preferred option from the drop-down. Range -100 to 1372 °C, with a resolution of 0.1 °C/°F to 999.9°C thereafter 1°C. Please note this logger is supplied excluding probes. The new ThermaData WiFi loggers utilise the latest WiFi wireless technology. The loggers are a battery powered, cost-effective, temperature monitoring system that remotely records the temperature of appliances and buildings. Each logger transmits the recorded data to a WiFi router connected to the internet which can be accessed and viewed from a PC, laptop or tablet anywhere in the world. To add recommended probes and other accessories select your choices from the 'Add Accessories' dropdowns, then click 'Buy Now! button. Please ensure you select the relevant probe type K or T to match product you are purchasing. The loggers have a range limited to the specification of the users WiFi router. Each logger has a intuitive LCD displaying temperature, WiFi connection status, max/min recorded temperatures, alarm status and battery life. At programmable intervals, the loggers will record temperature from both sensors, recording up to a maximum of 18000 readings (9000 from each sensor). Each logger incorporates a red and green LED. The flashing green LED indicates that the logger is active/logging and the flashing red LED indicates that your customised preset alarms have been exceeded. 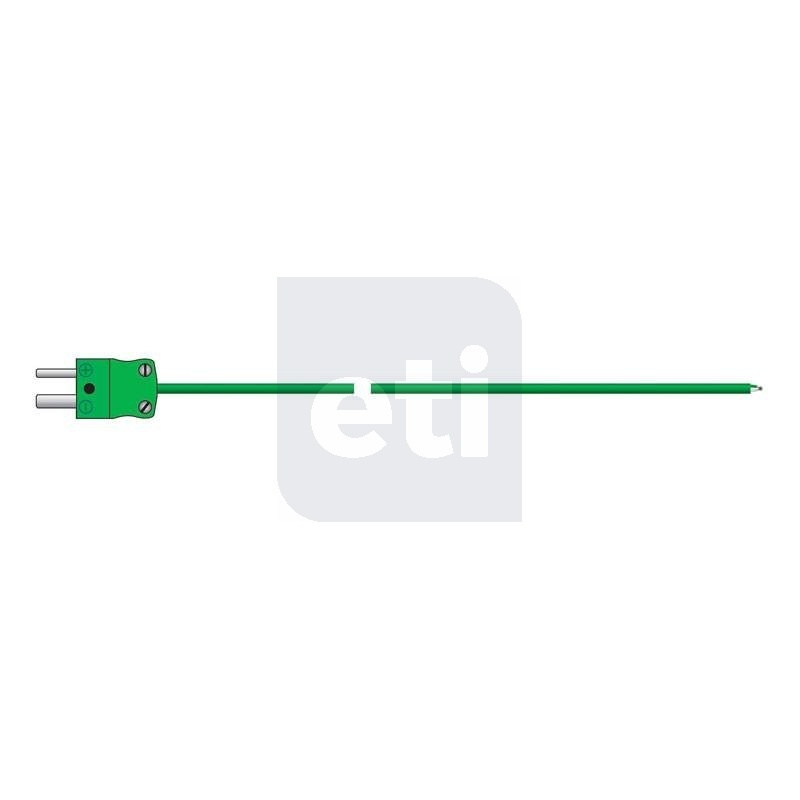 Each unit is supplied with a USB lead. ThermaData Studio software is available to download FREE from our website and is licence free, no ongoing or subscription charges. How does the ThermaData WiFi logger work? 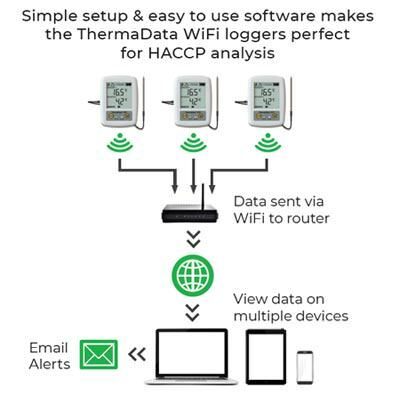 Using the unique ID of each logger ThermaData Studio creates a secure connection between logger and software which can be accessed and viewed anytime and anywhere with an internet connection. Each logger communicates directly to the WiFi router at set intervals to push data through the internet into ThermaData Studio. The information is available to be analysed and exported into a report format. 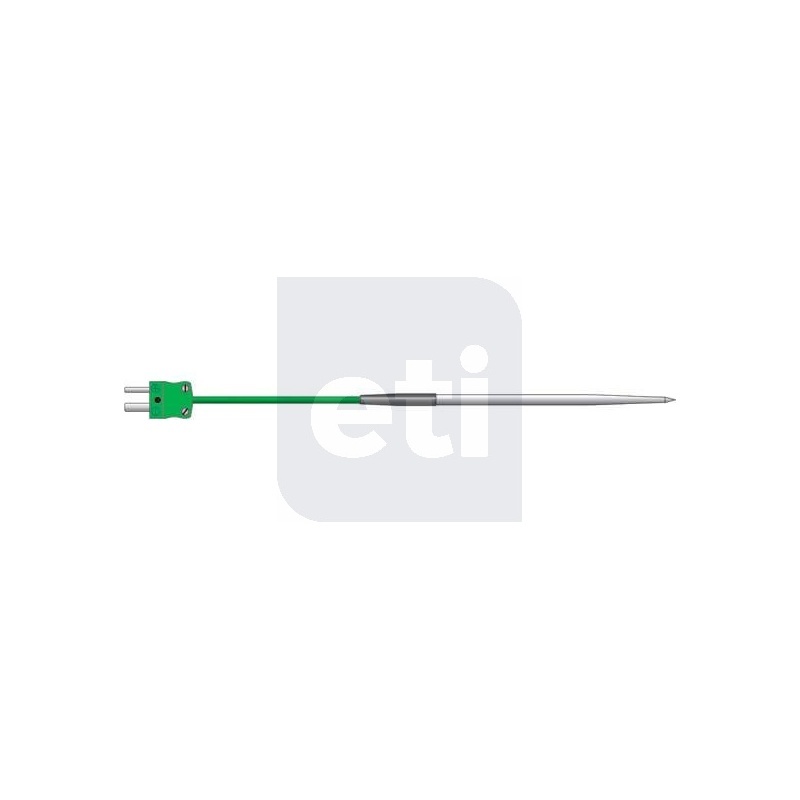 Food simulant Temperature Probe - This polypropylene food simulant probe is designed for use in refrigeration and food storage. The probe simulates the temperature of foods in chill cabinets and similar appliances. Maximum probe temperature 100°C. Q: I have entered a network name and a password. The software says “Wi-Fi network set” and I have clicked “ok” but I cannot access the logger settings? A: Check that the network and password are correctly entered and try again. Q: I have no WiFi Symbol or Cloud Symbol on my Thermadata WiFi instrument? A: WiFi Symbol represents the network and the cloud Symbol an internet connection. Please ensure your WiFi Router is switched on and connected to the internet. Q: When I push the Start Button repeatedly 5 times, I do not get a Pairing Key? A: Make sure the batteries are correctly inserted, and/or remove them for 1 minute, and then put back in. Q: My Device is showing “ERR”? A: Please ensure you have a probe connected to the instrument. If probe is connected, the probe could be faulty. Q: How do I disable Sensor 2? A: Connect your device to the internet, grant full access to the logger, and enter “logger settings”. Sensor 2 can be disabled on the 3rd page. Q: What does the memory bar along the bottom of my device mean? Why is it missing? A: The bar along the bottom of the LCD screen represents the contents of the internal memory within the instrument. The bar will slowly grow, as more readings are stored. If there is no bar showing, the memory is empty. The memory of the device will be erased each time new settings are sent to an instrument. Q: Why does my live reading in the software show AUDIT? A: The audit function has been activated on the ThermaData WiFi instrument. Audit will be shown until the next transmitted temperature is received. The instrument will show audit the first time an instrument’s settings are set using the audit function to force an immediate change, up until the next temperature transmission. Q: Why can I not download from my logger? A: Do you have full access to the logger? To gain full access, go to My Instruments, enter the serial number of the logger, select Full Access, and follow the prompts. Alternatively, if you have read only access, click on the options (…) on the far right of the ‘my instruments’ list, and select Upgrade to Full Access. Is the Logger connected to the internet, and the cloud symbol visible? 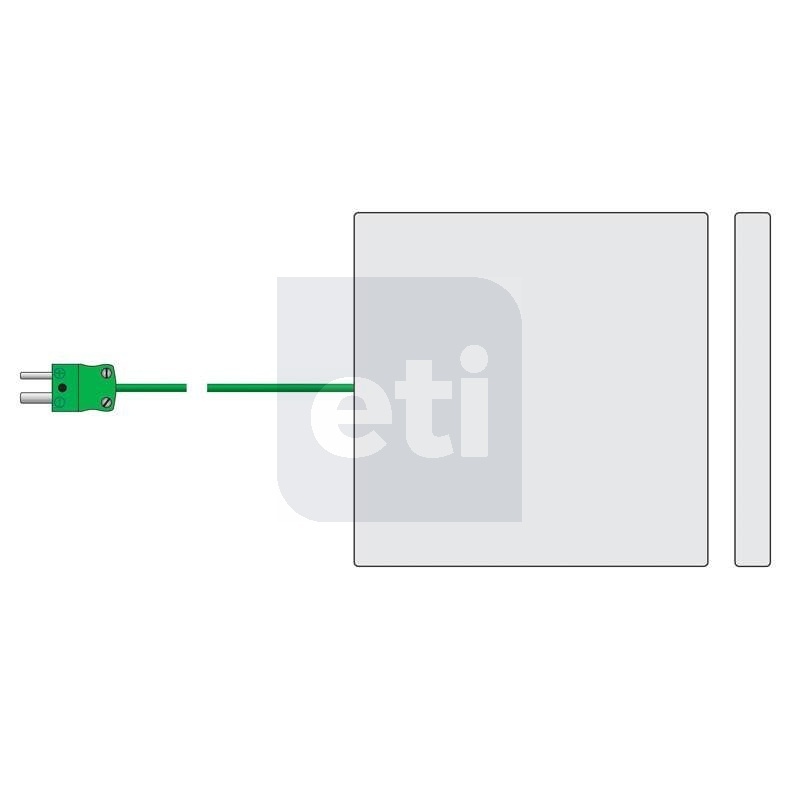 If the router has lost internet connection, use the supplied USB cable to connect the logger to ThermaData Studio. Q: How do I export to Excel? A: With either a live file or downloaded file, go to file > Save as, and choose how to export the chosen file. Q: How to I set up Email Alerts? A: Within ThermaData Studio, Go to File> Options and select Email - Server. Enter the Email address that you want emails to be sent from into the ‘send Email as’ field. If server details are available, a link will appear beneath this field. If not, please enter all the email fields manually. Once this has been set up successfully, select Email - Destination on the left-hand menu. On this screen, enter all the email destinations you require an email alert to be delivered to. Finally, select Email - Filter on the left-hand menu, and select which instrument and which high/low alarms you require alerts to be sent for. Q: Why are there gaps in my graph / data? A: Whenever the instrument or the computer running ThermaData Studio loses internet connection, and/or misses a transmission, the data will not be populated within the ThermaData Studio live graph. The readings will not be lost, and can be manually downloaded from each individual instrument. The live graph cannot however be ‘repopulated’. Q: Why are all my icons within the ThermaData WiFi tab greyed out? A: Please ensure there is not a second instance of ThermaData Studio running in the background. If so, please ensure all ThermaData Studio processes are closed within task manager, and then reload the program. Q: When I connect an instrument to the computer via the USB lead, ‘Configure WiFi’ doesn’t do anything. A: Please ensure all the drivers have been successfully installed. If not, please unplug the instrument and try plugging the USB lead in again. If it will still not work, scan the internet for a driver update via Control Panel>System>Device Manager>Human Interface Devices.